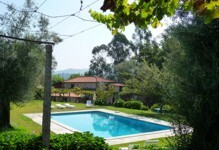 Villa Casa da Eira is in the beautiful estate of vineyards at Solar das Boucas which is bordered by the Cavado River. The quiet of the property is only broken by the local summer time religious festivities taking place in the surrounding villages and the 'Vindimas' in September when the wine grapes are picked and pressed to produce the famous Vinho Verde wine. This activity is famous in the region and everyone can participate. The Manor House, the home of the owner, Baron de Van Zeller, is a few metres from the house. Downstairs there is a fully fitted kitchen with hob/oven, a traditional bread oven, fridge, microwave, dishwasher, toaster and kettle. The open plan living/dining room has a table for 6 people. The sitting area has a television, sofas also for 6 and a small salamander. French windows lead onto the garden. There is also a twin bedroom with an en suite shower room. The upper floor has two twin bedrooms, one with a small en suite shower room and the other with a large bathroom. Both rooms have doors onto a large wooden terrace with a hammock for lying in the sun. In the garden there is a stone annex containing the laundry which has a washing-machine. Guests can use the nearby swimming pool of the Manor House. Its size is 12 by 5,5 metres and the depth from 2.2 to 1.1 metres. 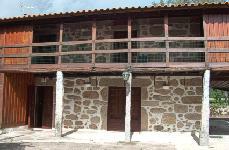 It is shared with people staying in the other self-catering villa on the estate, Casa Montariol. The small town of Amares, with shops and restaurants, is about 3 kilometers away. Solar das Boucas is about 12 kilometers from the historical and religious city of Braga and 20 kms from the Peneda do Geres National Park. The cities of Guimaraes and Porto are easily reached by motorway. The recently expanded airport at Porto is about 50 kilometers. Low fares to this airport are now offered by a number of airlines.